Seems like it could be a cool concept if expanded upon. I agree that it was pretty tough starting out with obstacles that were also affected by the bellows, maybe it would be better to introduce that slower and later in the game. 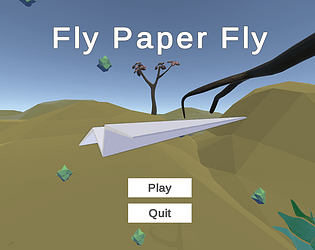 I liked how your solution to make a flying game without flight controls! The execution is a bit rough though, with somehow weird controls. Also I got a little frustrated by moving the obstacles when trying to move just the plane. I realize it's part of the challenge, but maybe restricting the "air push" to only move the plane could lead to some more interesting situations, in terms of level/wave design. Thanks for the review and I agree with your point. Level design needs to be very careful if we keep the blowing away of obstacles as a mechanic. The challenge of this game as we imagined is to find the gaps in the patterns of seeds (bullets) to push air through without disturbing them. Nifty little play with the (lack of) control! Note: In last minute changes a bug was introduced. When you die in game, clicking Play to restart the game is not working properly. Please quit the game and launch again to replay. Thanks.